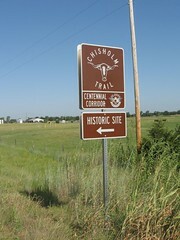 The Abilene Cattle Trail crossed the Cimarron directly before you. 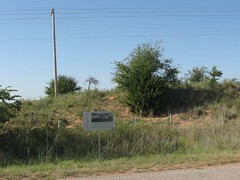 About a mile west, the Fort Sill - Arkansas City wagon road. 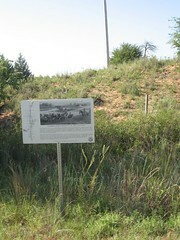 The western variant of the cattle trail through Ft. Reno and the The Darlington Agency, crossed the Cimarron. A short distance north of the river, the two trails joined just before reaching the Red Fork Ranch as they continued northward. Some 50 miles south, before crossing the south Canadian River, The Abilene Trail split. The mail trail continued almost due north to this location. But a western variant developed that ran to Fort Reno and the Darlington Indian Agency. Drovers wanting to sell beef to the Fort and the Indian Agency took this route as a detour as they headed north to the railheads. 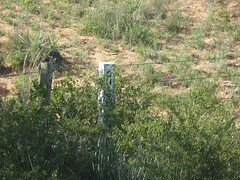 First road to the east after you cross the Cimarron River Bridge OK 81 highway, 1 mile and Right side of road.